Ladies & Gentlemen, we have arrived at yet another Bridal Season. Before I start this recap let me just say that these aren’t you mother’s wedding gown. 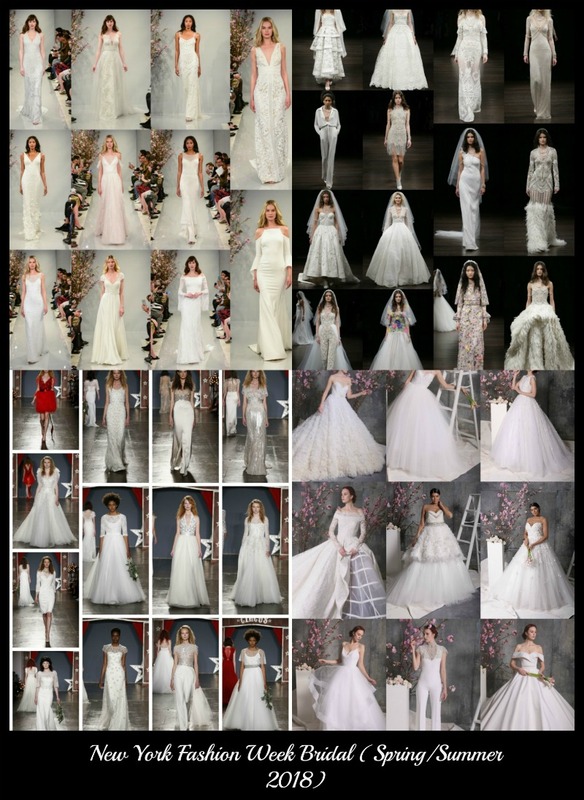 I personally looked forward each season to see just what are going be the hottest trends in bridal fashion. As usual, this season did not disappoint. There was no shortage of imaginative themes, elaborate detailing and so much more. Here’s my recap of some of the collections from last month’s NYFW Bridal. The designer is continuing his message of inclusion by featuring a plus size model wearing several gowns from this collection. 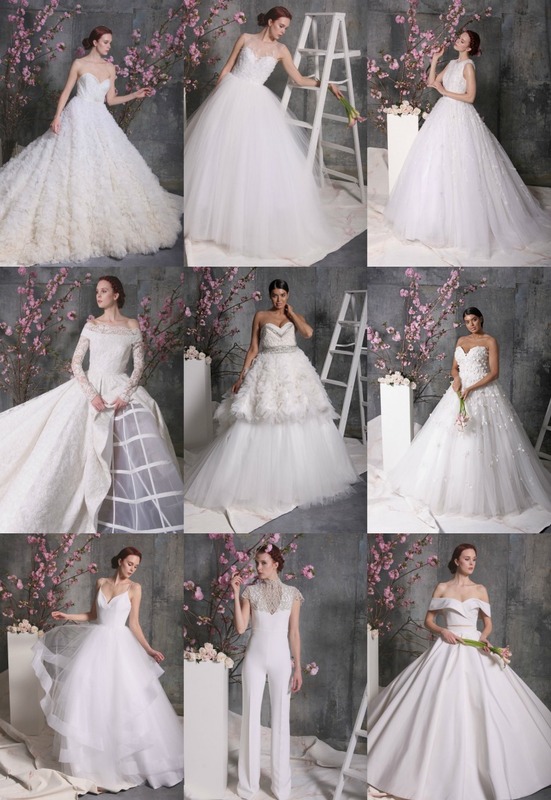 If brides-to-be are looking for a more classic and traditional gown, then this collection is for them. 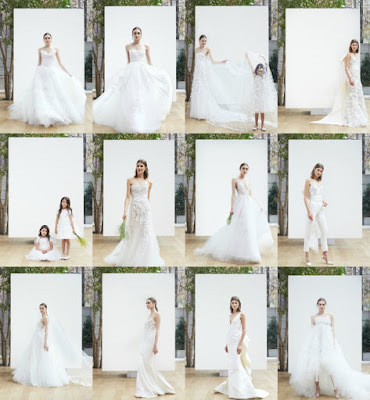 “This is the most body-conscious collection I’ve ever done,” Katharine Polk explained at a preview of her Spring ‘18 bridal lineup as reported by Vogue Runway. What I loved about this collection arethe elements that serve as a subtle nod to Old Hollywood Glamour. One of my personal favorites is the moto jacket paired with the bell-bottomed pants. According to WWD, Ornate butterfly appliqué, laser cut lace and even color, like a glitzy mermaid gown in metallic gold thread linen and gold leaf printed silk organza are just some the elements that appear in this collection. I am loving the dramatic trains. According to Creative Director Don O’Neill, much like the Fall 2017 collection the inspiration behind this collection is “pearls of wisdom”. 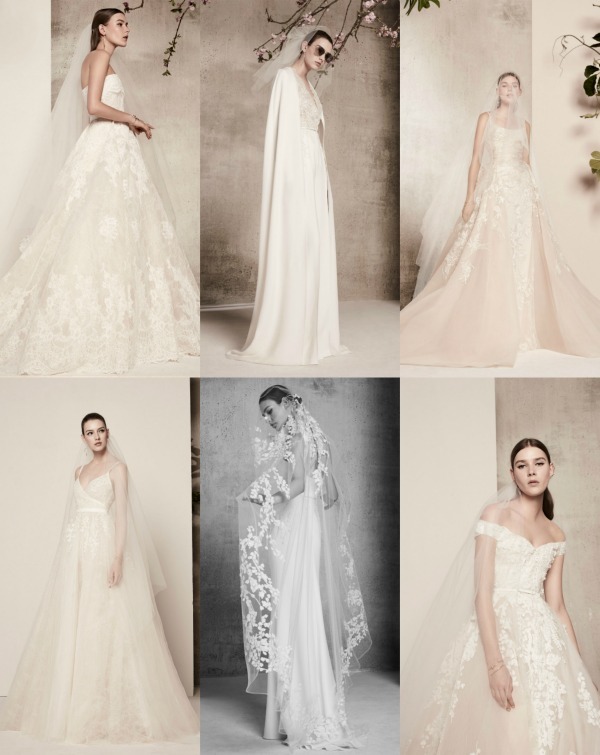 It was communicated throughout the collection the pearl embroidery and color palette consisting of ivory, white, blush, pale blue and pale gray. One thing I notice is the variety of neckline which is sure to suit brides perfectly depending on their taste. Opulence & Cherry Blossoms are just some of the notes found in this collection. The floral motifs translated the inspirations without being too overpowering. This collection also marks the designer’s first using Blush which he executed. Overall, the collection was vividly detailed yet demure at the same time. Of course, I couldn’t forget one of the legends for bridal fashion Vera Wang. This time around the collection didn’t feature any different color gown. 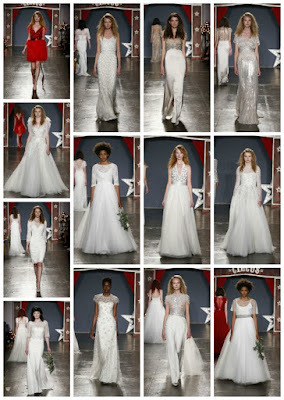 Instead, the collection was appropriately named “The Bride Wore White.”. Each gown has distinctive style and name such as FLORENCE (2nd row & image), & EDYTHE (1st row & 3rd image). The only thing I wasn’t biggest fan of is the chosen hairstyle. According to their Instagram, Brides-to-be in the Beverly Hills area will get a chance to view the corresponding film featuring the collection from now until this Sunday. You can also be among the first to preview and shop for your favorite gown from the collection at their Beverly Hills location. You can also schedule your appointment on the website. This designer is new to me, but when I saw his collection I just had to include it. The gorgeous location of Caesarea, Israel served as the perfect backdrop for this stunning collection. What I found innovative about this collection is versatility of the pieces. Brides can switch up their gowns to a reception look or etc. with ease. It was hard to pick out just one look as a favorite. What international brides truly want is the focus for Khan especially in this collection. You won’t find the latest hottest trends here. Instead what you will find is specially tailored looks such as a jumpsuit which was a standout for me. This collection was one of my favorite from the week predominantly for the theme. I love the Circus theme (Stars & Circus letters in the background) because it brought something different to the week. Packham opens the collection with this red stunner which I could even see as a bridesmaid gown. She also adds two more additional red and several metallic looks. What’s great is how the designer could add pops of color without it being too heavy handed. 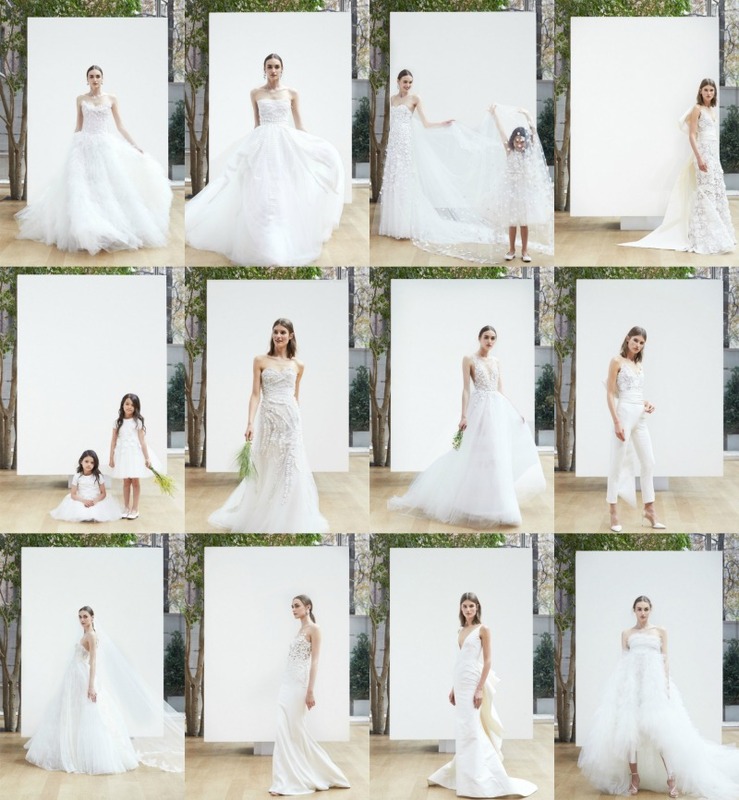 This collection marks first bridal runway show under new co-creative directors Fernando Garcia and Laura Kim. The duo decided to christen their debut collection with paying tribute to the late designer by including flowers. 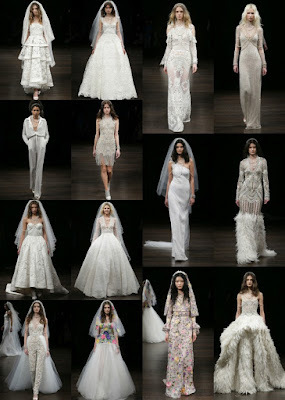 Each gown appeared to very light-weighted yet finely detailed. Another signature of the label is the flower girl option which I was glad to see Garcia and Kim include. 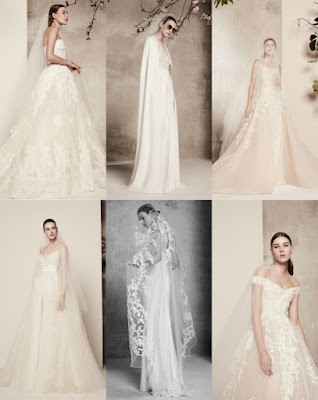 For the 1st collection, I think they successfully displayed their own version of what Oscar de la Renta was known for when it comes bridal fashion. 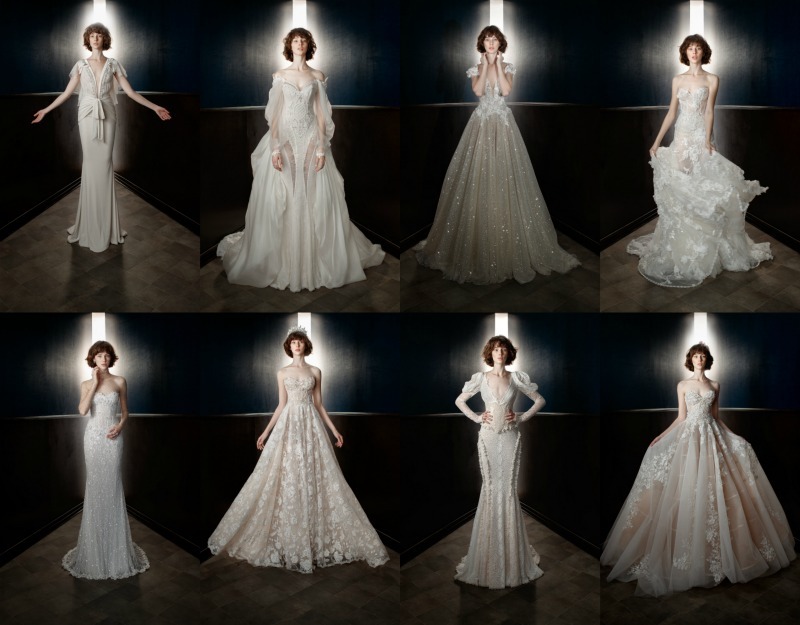 During this season the designer to show both of his namesake lines Galia Lahav Haute Couture and Gala by Galia Lahav together. For his couture offerings, brides can look forward to Victorian-inspired gowns consisting of high necks, corsets and neck pieces. This happening to be a new addition to the brand. While over at Gala is more catered to the bohemian bride with more flash by way of embellishments and embroidery. The designer is also new to me, but I decided to include collection. What drew me to this specific one is the retro design elements of the 40s & 50s in the gowns. The designer could do this with her color palette made of Blush, Ivory, Champagne and Light Bronze. 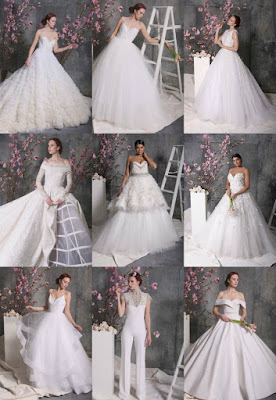 Although the collection it is concise than some of the other collection I think each gown manages to catch your attention. 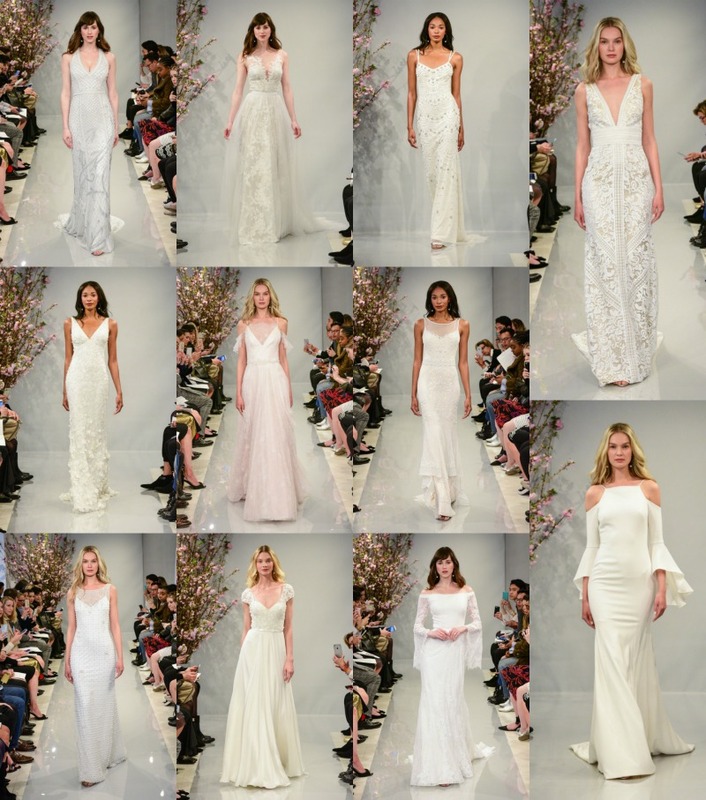 I couldn’t possibly recap all the collections from the week I will say brides-to-be will have plenty to choose from next Spring. I can certainly see jumpsuits and capes being the most popular among trends based on their numerous appearances. Which collection was your favorite? What trend was your favorite? Let us know in the comments below. All images/information appear courtesy of WWD& Vogue Runway.